Tallying up the results of the G8 and G20 summits in Canada, President Medvedev has said both the gatherings were productive and a number of crucial topics including finance, ecology and nuclear security were discussed. “The summit in Toronto is over, so the Canadian security services can get rest,” Dmitry Medvedev wrote on his recently created profile on Twitter. “The G8 and G20 were productive. We discussed important issues for everyone: drug trafficking, the environment, nuclear safety and finance,” he said. To “set an example”, the Russian leader vowed to submit to the State Duma a law protecting the sea from oil contamination. “Ecology is not secondary,” he tweeted. Canada is getting back to peace and quiet following several days of hectic activity and anti-globalist rallies as world leaders gathered in the country to talk about issues that concern the international community. Earlier, the Russian leader spoke to journalists about the results of the two summits at a media conference in Toronto. The G8 leaders – France, United States, United Kingdom, Russia, Germany, Japan, Italy, and Canada – traditionally focused on political and security issues. The Iranian and North Korean nuclear programs “which cause great concern”, regional problems – such as the situation in Afghanistan and Pakistan – as well drug trafficking were on the table for discussion. Medvedev called for more efforts in combating drug trafficking on the global scale, rather than in separate regions, since narcotics are being smuggled to countries where it is profitable to sell them. Earlier, CIA Director Leon Panetta said the agency believed that Iran has enough low-enriched uranium to create two nuclear weapons, but it would likely take about two years for the Islamic Republic to make the bombs. 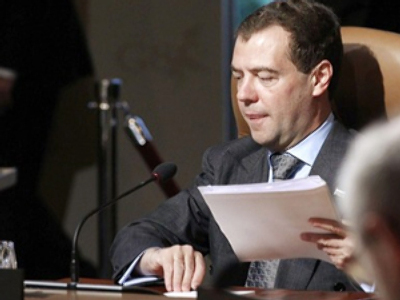 Commenting on the issue, Medvedev said that information needs to be checked. “In any case, such information is worrying, considering that the international community does not believe that the Iranian nuclear program is transparent,” the president said. Some politicians have been calling for the G8 to be reformed or changed, since it has no potential left. Medvedev said he believes the forum has a future.